The former shogunate army was very angry that the new government did not add Tokugawa to the administration. 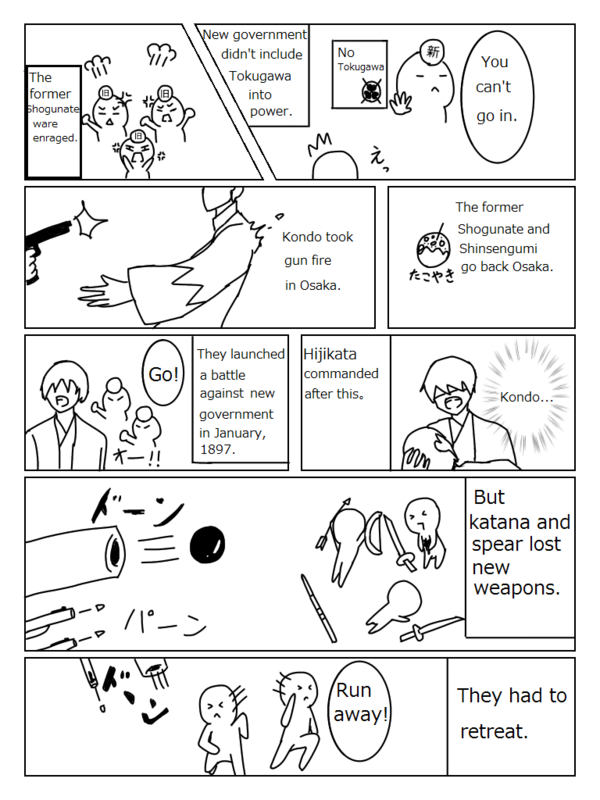 Shinsengumi also went to Osaka to protect the Tokugawa Yoshinobu and the former shogunate army who went to Osaka. However, Kondo Isami was attacked there. It was a revenge by sbordinate of Ito Kashitarou. By this, Hijikata Toshizou was to take command. In January 1867, they challenged battle the new government. But,in the tactics which used sword and spear war, we could not fight Satsuma and Choshu as it is with state-of-the-art weapons, and was forced to retreat. This is the first game of the Boshin war.